It is felt the ground reality on jobs was not being ‘properly’ captured as the existing system takes into account only the formal sector. 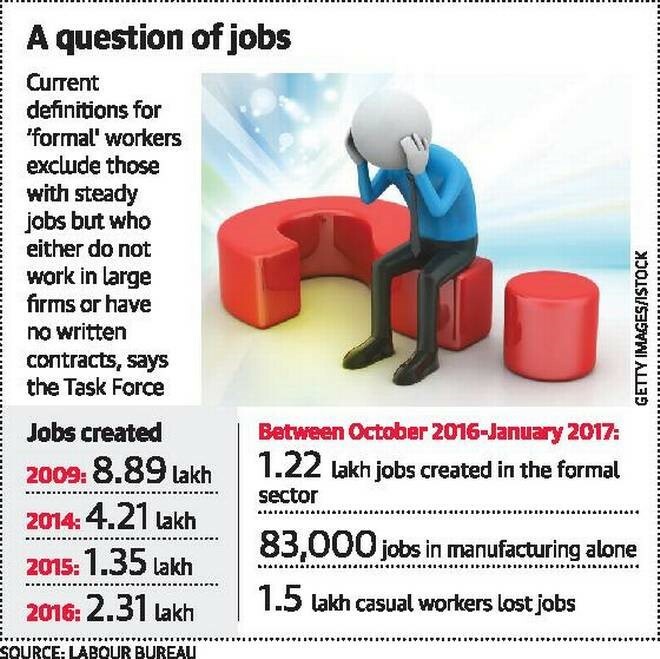 There is no fixed definition of formal workers currently in India. The task force was set up in May 2017 under the chairmanship of Mr. Arvind Panagariya. The panel’s terms of reference included assessing the existing data systems and sources that provide information on jobs and job creation and then identifying alternate sources that could provide such data. The terms also included recommending mechanisms for capturing information on jobs and job creation on a regular basis for both the informal and formal sectors. All the economic activity in India, including in the Micro, Small and Medium Enterprises (MSME) and informal sectors, will get properly captured. The scheme was started in 2013, with a target to provide monetary incentive to at least 500 inter-caste couples, where either the bride or the bridegroom is a Dalit, per year. This was meant to “appreciate the socially bold step” and to enable them to “settle down in the initial phase of their married life”. The scheme’s stated purpose was to counter the Hindu practice of marrying on the “traditional grounds of jatis (castes) and up-jatis (sub-castes)”. The idea is derived from the teachings of Babasaheb Ambedkar, who said that caste and endogamy (custom of marrying within one’s own community) are the same thing. He had noted that, “prohibition, or rather the absence of intermarriage is the only one that can be called the essence of caste” and advocated “fusion” through intermarriage (exogamy). The target for each state is fixed in proportion to its share of Scheduled Caste population, though states are allow to exceed their targets. In a recent order, the Ministry of Social Justice and Empowerment directed that “the condition that the total income of the newly-wedded couple will not exceed Rs 5 lakh per annum” be scrapped. Issue- Awareness about the scheme is very low, most of the proposals come from a few states such as Andhra Pradesh, Telangana and Maharashtra. The government recently announced incentives totalling Rs 8,450 crore to help boost exports. The incentive rate has been raised by 2 per cent under the Merchandise Exports from India Scheme (MEIS) and Services Exports from India Scheme (SEIS). The additional incentives have been provided for exports by small and medium enterprises, labour-intensive and agriculture-based exports among others. The mid-term review of the five-year FTP aims to promote exports by simplification of processes, enhancing support to high employment sectors, leveraging benefits of GST, promoting services exports and monitoring exports performance through state-of-the-art analytics. The government has set up a “state-of-the-art” trade analytics division set up in DGFT for data based policy actions, which will improve policy making process and making it a dynamic and evidence driven. Self-certification scheme for duty free imports. A single point electronic contact to traders with the Directorate General of Foreign Trade for trade and consignment related queries. Creation of a logistics division in the department of commerce. The government is also working on Ease of Trading rules to make processes simpler for exporters and importers. An e-wallet system to address the liquidity problem being faced by exporters is likely to be operational from April 1, 2018. Under the MEIS scheme available to exporters, identified sectors are given duty exemption scrips, which are fixed at a certain percentage of the total value of their exports. These scrips can be used to pay duties on inputs and can be traded. Google is all set to extend its free Wi-Fi services beyond railway stations to include entire cities as part of the company’s Next Billion User initiative. Google has already connected 227 railway stations in India through Google Stations to provide high speed connectivity. Google last year announced that it will be connecting 400 railway stations with high speed internet connectivity in partnership with the Indian Railways and its telecom arm Railtel. Pune will be the first smart city to receive free connectivity across the city from Google Stations initiative. While Google maintains that it does not plan to monetise Google Stations, it is testing out advertising and possibly paid upgrades to create a sustainable model for Google Stations. Similar to Google, Facebook has also been offering Wi-Fi services in several villages across the country. However, in order to make the initiative sustainable, the company charges users small fee such as Rs. 10 a day for 300Mb usage through its Express Wi-Fi initiative. Google has also announced that Google Assistant, the company personalised artificial intelligence-based assistance will be supported on the Reliance Jio Phone, including voice command in multiple Indian regional languages. The search engine giant also introduced a new Two-Wheeler Mode in Google Maps, which will offer navigation especially for two-wheeler riders. Two-wheeler mode has been launched in India initially and will be offered in other countries subsequently. The search giant also announced the availability of a special version of Android, the Android Oreo (Go edition), which will make entry-level smartphones. Young and aspirational, the millennial generation that makes up about 40% of India’s population has long been regarded as the driver of future economic growth. Yet, the gap between the productive labour force and the employment and entrepreneurial opportunities available to them continues to widen. The fourth Industrial Revolution has already made its mark on certain sectors. As technology continues to surge forward in leaps and bounds, both blue- and white-collar jobs will become increasingly sparse. The economic turmoil that could be brought on by further large-scale disruption should be a cause of concern. With prestigious and highly regarded Indian sectors such as IT amounting to little more than cyber “coolies”, the manufacturing and agricultural sectors are in an even more precarious situation. Much of India’s workforce is already hampered with outdated and irrelevant skills. Policymakers recognize the problem and have taken steps to combat it. The “Skilling India” programme aimed at accelerating the pace of skill development, creating new employment opportunities and reforming India’s archaic labour ecosystem is a positive step. However, the challenges faced by the ministry of skill development and entrepreneurship (MSDE) are complex and varied. In order to skill 400 million young Indians by 2022, the MSDE is forced to coordinate with 22 departments and ministries at the national level, and many more at the sub-national levels. The MSDE also must account for the possibility of intra-state migration, rapid urbanization and possible changes in social fabric as populations react to new job opportunities. A prime example of the worst-case scenario can be seen with the National Skill Development Corporation (NSDC), an autonomous entity functioning under the MSDE. Tasked specifically with the responsibility of skilling 10 million people by 2020, the NSDC has struggled to achieve its goal. If India wishes to avoid economic stagnation and societal upheaval, following needs to be done. Additional policy measures must be undertaken to cut through bureaucratic red tape and bring clarity to the policy framework. Creating a coherent organizational structure—the NSDC, for example, has been tasked with managing the financing processes while also implementing the skilling programmes. Separating the two tasks and allowing the ministry of finance to manage the financial aspects would allow the NSDC to focus on its core competencies, allowing it to be more effective and efficient. MSDE should focus on implementing a multi-skilling aspect to its training programme moving forward. As job markets evolve at unprecedented rates, it is incumbent upon the MSDE to provide its trainees with more than one way to earn a living. The ministry should also explore the possibility of programmes aimed at skilling and reskilling older “educated” populations that might be left behind owing to disruption and technological advances. The curriculum and education system offered also needs to be overhauled. Industry sources claim that close to 90% of trainees have limited understanding of the business sectors they are entering. For many skill programme graduates, the training does very little to prepare them for their day-to-day jobs. Targeted initiatives focused on updating skills can help ensure that the training benefits its intended audience. A solutions-based approach, where instructors employ case studies and present relevant problems, would provide students with a holistic education, allowing them to compete at both the national and international levels. Implementation of licensing and regulation procedures can also help boost the Indian labour force’s chances globally. Most developed nations have systems in place to ensure that electricians, plumbers, agricultural machine operators and other skilled trade workers update their skills regularly through the licensing and regulatory mechanisms. Implementing such a system without creating additional layers of burdensome bureaucracy could be a key difference marker for the Indian labour force moving forward. Cutting away excessive bureaucratic fat, implementing structural changes to the pedagogy of the skill training system, and installing licensing and regulatory mechanisms are all important steps to help reskill India. The most important change needs to happen on a cultural level. Skill training should be viewed as a complementary part of mainstream education, rather than being regarded as an inferior alternative. Otherwise, India’s youth will be relegated to the same conditions that their grandparents were subject to. The gap between the productive labour force and the employment and entrepreneurial opportunities available to them continues to widen. This is despite the ongoing Skill India mission. Discuss the issues and way forward. The annual publication of the National Crime Records Bureau (NCRB), “Crime in India 2016”, which was released recently, presents a dismal picture of the key performance statistic with only 47% convictions in Indian Penal Code (IPC) crimes at the national level. Case study- In Delhi, DNA testing, which can secure higher conviction rates, is, inexplicably, a low priority. There is only one forensic testing laboratory, with around 9,000 samples pending for examination. Over 5,000 are DNA samples. Delays in this crucial evidence, which plays an important factor in acquittals, are a setback as samples deteriorate with time. In most countries, the prosecutor, and not the police, has discretion on whether to press charges as they involve adjudication. Years ago, the Law Commission had suggested a directorate of prosecution independent of the police to guide investigation. For example, special and local offences account for as much crime as under provisions of the IPC, with nearly 60% of cases under liquor and narcotics offences at the national level. Causing simple and grievous injures under rash driving accounts for 11% of IPC crimes; theft also accounts for 16.6% of IPC crime at the national level. Nearly two-thirds of the prison population is awaiting trial and half the number of undertrials are normally acquitted. Over 80% of prisoners are sentenced to terms less than three months, 40% are under 30 years old, semi-literate and convicted under special and local acts. Short-term sentences expose such prisoners to criminal indoctrination in jail and social condemnation on release. The focus should really be on reorganising criminal administration. The key statistic of police performance is not merely correct reporting and recording but charge sheets and convictions. Thus the focus should be on reducing conviction rates. There is a need to distinguish between accountability and operational responsibility. For example, ‘the Mayor of London is responsible for setting policing priorities that will hold the Met Police Commissioner to account. Operational decision-making on day-to-day policing remains the responsibility of the Metropolitan Police Commissioner. The Police and Crime Plan 2013-2016 has clear performance measures that focus on results such as 20% reduction in key neighbourhood crimes, 20% reduction in delays in the criminal justice system, and 20% reduction in reoffending by young people leaving custody. The criminal justice system should be limited to crimes under the IPC, while enforcement of administrative law and social legislation requires a different approach involving summary trials, changing societal attitudes and modes of behaviour. For example, in Britain part-time lay judges outnumber full-time judges, leaving the judiciary to concentrate on the real crime. The main purpose of criminal administration should be the prevention of crime, and the police cannot be an instrument of social change. Administrative measures and fines levied will change behaviour better than penal action.Crime prevention is affected by conviction rate, beat patrolling, and by the police and community working together. The main purpose of criminal administration should be the prevention of crime, and the police cannot be an instrument of social change. In this light criminal administration in India needs to go beyond police reforms.